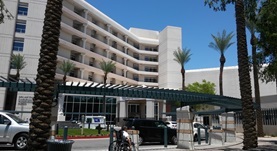 Dr. Andrew Liguori graduated the medical school from the Arizona College of Osteopathic Medicine of Midwestern University and completed his residency program at the St Joseph's Hospital and Medical Center. He is specialized in Radiology and is able to use imaging techniques in order to gather information about the human body. Dr. Liguori is affiliated with St Joseph's Hospital and Medical Center and during his career, he has also published two writings of medical interest in collaboration with other doctors. Dr. Andrew Liguori has contributed to 2 publications. VSD following blunt cardiac trauma: MRI findings. Liguori, A. E.,Maertins, B. A.,Richardson, R.; Emerg Radiol. 2013 Apr 23. Molecular genotyping of Acinetobacter spp. isolated in Arizona, USA, using multilocus PCR and mass spectrometry. Sarovich, D. S.,Colman, R. E.,Price, E. P.,Massire, C.,Von Schulze, A. T.,Waddell, V.,Anderson, S. M.,Ecker, D. J.,Liguori, A. P.,Engelthaler, D. M.,Sampath, R.,Keim, ...; J. Med. Microbiol.. 2013 Sep.